Note to readers: the "News in the Visual" blog posts referenced below have now been moved to the "What Gets Saved" category on THE BIGGER PICTURE (2/20/2011). Talk about ironic. The whole time I’ve been writing “News in the Visual” blog posts—and dutifully researching the history of, and the controversies that surround surveillance culture—someone’s been watching me. I realized it a couple of weeks ago, as I was walking up the stairs to my loft. 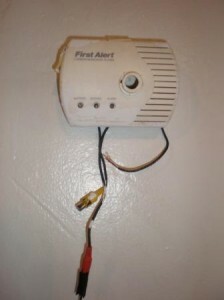 Dangling off the hallway wall, some wires—formerly connected to the carbon monoxide monitor mounted high up on a stairwell wall and facing my door—were lying near the ground. Upon closer inspection, I saw some video-connector jacks attached to the wires and knew, immediately, that something was very wrong. All it took was one sharp tug to the wires to the monoxide monitor, and down it came. 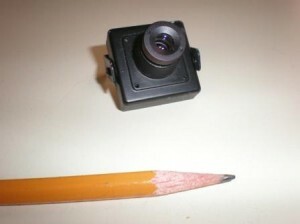 When I pried open the device’s cheap plastic housing, nestled in it was a small video camera about an inch square, the size of an after-dinner chocolate mint. The landlord, who’s been harassing me and other tenants in my building and on our block for over 25 years, was turning things up a notch. Given my ongoing research for THE BIGGER PICTURE—where I routinely run across stories like, for example, the man charged with hiding a camera disguised as an air freshener in a co-worker’s bathroom, I wasn’t surprised. But I’ve got to admit to being momentarily stunned. While it’s been my job and joy to look at and think about photographs over the years, including quite a few made without permission or their subject’s awareness, this was a creepy and watershed moment for me. The carbon monoxide monitor, in case you’re wondering, hasn’t been replaced yet. And as you might imagine, I’m checking for places where cameras might be hidden, every time I get near my door. Just another bit of proof that, as we say at the Photography Initiative, photography changes everything.